Adelaide City FC is pleased to announce it will be holding trials for the 2019 season in the boys and girls age groups u6 – u18 from Tuesday 25 September to Friday 28 September 2018. All participants, both existing players and new players seeking to join Adelaide City FC, will need to Pre-Register for trials here. Saturday 29th September will remain available if required by coaches at their discretion, or should poor weather necessitate additional time, for final trials to be conducted. 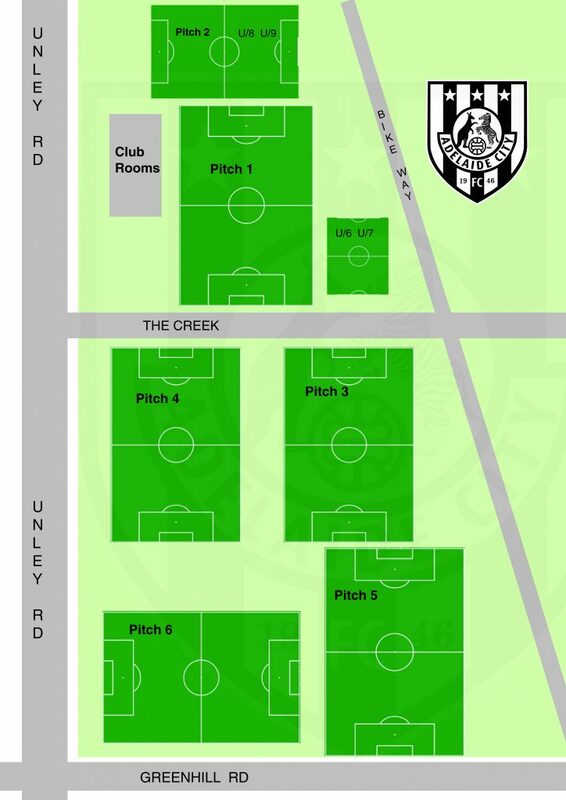 A map of all the pitches will be available on the Adelaide City FC website and will be signed at the trials. All existing and new players are required to Pre-Register for trials here. All male players participating in the trials who have pre registered are to go direct to their allocated age group pitch upon arrival at Unley Road Park where they will be marked as in attendance having reported to the coach. Participants who have NOT pre registered are to go direct to the Unley clubrooms upon arrival for trials where they will pre-register before proceeding to their age group pitch. All female players participating in the trials who have pre registered are to go direct to their allocated age group pitch upon arrival at Adelaide City Park, cnr Fosters Rd and Hilltop Dve, Oakden where they will be marked as in attendance having reported to the coach. Participants who have NOT pre registered are to go direct to the Coach on field upon arrival for trials where they will pre-register. Existing Adelaide City players are to wear their match day strip. New players are to wear their current club strip or suitable playing apparel. If trialists are unable to attend Adelaide City FC trials, they still need to Pre-Register here and advise accordingly, as early as possible with a view to an earlier trial. Players may be selected at any stage during the trial process and will be advised by email. Unsuccessful players will be advised immediately by email after their trial process is complete. Adelaide City FC will be selecting Junior Premier League (JPL) and Junior State League (JSL) squads at these trials. Movement between these squads may occur once the season starts and is dependent on player performance and attitude. Successful trialists need to complete the information pack and pay within 24 hours of receiving their email. The 2019 FEE STRUCTURE will be released and advised in the coming weeks. Unley Road Park Clubrooms will be open from 6-8pm Tuesday 25th September to Friday 28th September for payments. Any queries regarding this process please email admin@adelaidecityfc.com.au. Adelaide City FC wishes trialists all the best for the trials and their football future.